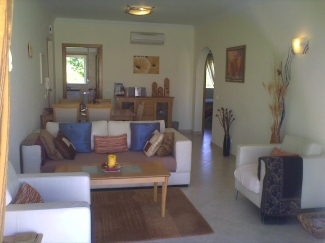 Personally managed by the owner Sally, 108 Oasis Parque is a 5 star 2 bedroom self catering apartment. 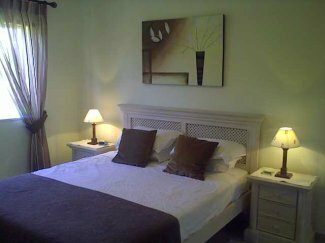 Beautifully furnished in neutral colours, the apartment is spacious and airy and set in a quite but convenient part of the Parque, just a few metres from the leisure centre. The popular Oasis Parque complex has an onsite leisure centre with indoor and outdoor pools, tennis courts, jacuzzi, restaurant and bar. 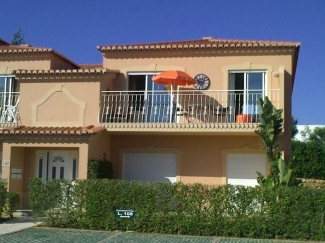 Within easy reach of the resorts of Alvor, Praia da Rocha and Portimao, the apartment is an ideal base for a relaxing holiday in the Algarve. 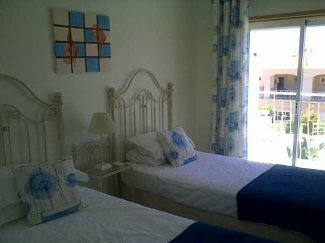 The property has satellite TV with English Freeview and Portuguese channels, a DVD & Hi Fi with a library of DVD's and CD's, an Ipod docking station, a selection of books and children's beach toys. 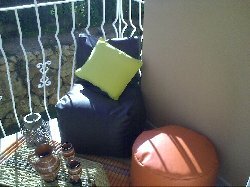 Outside is a double balcony with lovely views over the Monchique hills fully equipped with dining seating for 4 and comfortable bean bags, silky cushions and cosy throws and Moroccan lanterns (safety candles supplies) for relaxing on a warm summer evening. 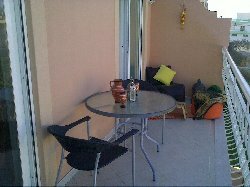 To the rear is a further single balcony where the evening sun can be enjoyed. 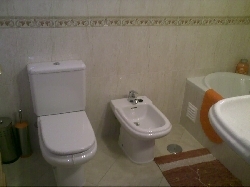 The bathrooms are both fitted with showers (over the bath in the ensuite. 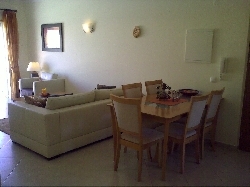 The property has air conditioning and heating and is suitable for year round holidays. For younger families, a cot and high chair are also available upon request. Sally and Luis look forward to welcoming you to the Parque and to helping to make your holiday truly memorable. An additional single inflatible mattress is available for a child under 16 for a charge of 50 Pounds per week. 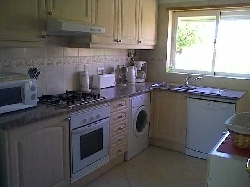 A discount is available for SINGLES, please enquire for a quote. 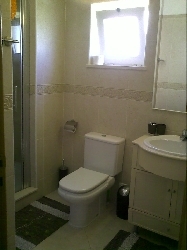 SHORT BREAKS are available, please enquire for a quote.